energy drinks sold in restaurants and grocery stores have caught the eye of food regulators in Maharashtra. In the first week of April, they seized large quantities of beverages sold under brands like Red Bull, Cloud 9, Fighter and SoBe Adrenaline Rush from godowns in Pune and Mumbai. Officials of the Food and Drug Administration found that the caffeine content mentioned on the labels was beyond permissible limits. "According to preliminary reports, caffeine content in the energy drinks is much higher than the permissible limit of 200 parts per million (ppm)," said Suhas D Chaudhary, fda's joint commissioner in charge of Greater Mumbai. The limit for carbonated non-alcoholic beverages has been set under the Prevention of Food Adulteration (pfa) Rules, 1955.In the case of Red Bull, the caffeine content in one can is 300 ppm. The samples are being tested in the laboratory, Chaudhary said. The test results are expected in mid-May and could lead to a ban on the sale of the drinks. Energy drinks have caffeine, sugar and herbal stimulants (see box 'What are energy drinks? '); they are popular among young people for combating fatigue. Their popularity notwithstanding, there are no food standards governing energy drinks in India. The pfa Act dates back to 1954 and so does not prescribe norms for them. Manufacturers use this loophole to challenge the categorization of the product as a carbonated drink. "Energy drinks are non-alcoholic proprietary food. This is mentioned on the Red Bull's can. We are meeting all regulations for such food items like labelling and nutrition," a spokesperson of Red Bull India Pvt Ltd said. Other manufacturers refused to comment on the guidelines they follow. The pfa rules however do not specify standards and regulations for proprietary food products except that their labels ought to display nutritional content of the product. The pfa defines proprietary food products as those that have not been standardized. It means these products can be marketed without adhering to any scientific standards, an official said. fda does not buy the claims made by the manufacturers of energy drinks being proprietary food. It insists that energy drinks belong to the carbonated drinks category. "Any beverage that contains carbon dioxide is a carbonated beverage and needs to follow the caffeine limit prescribed by pfa rules," the fda official said. Proprietary food includes packaged food, supplements, probiotics and energy drinks. There is no clarity on the category for these food products under pfa rules (see 'The new food chain', Down to Earth, February 15, 2005). The government did enact a comprehensive legislation--The Food Safety and Standards Act--in 2006 (see box'Yet to be notified') to plug this loophole. But it has not been implemented. The Act aims to provide scientific standards for a range of products including processed food, genetically modified food and proprietary food. It also prescribes rules for manufacture, storage and distribution of such products. Deputy Director of Food and Safety Standards Authority of India, Anil Mehta, said the Act is not in force as the accompanying rules and regulations have not been framed. He said the Act would be notified by end of the year and the pfa and other food legislations would be repealed. Energy drinks are considered particularly harmful when mixed with alcohol as they mask the effect of alcohol. Persons who drink the cocktail think they are sober and alert even if they are inebriated. Countries like Norway, Uruguay and Denmark have banned them (see box 'Statutory warning'). France imposed a 12-year ban on Red Bull that was lifted in 2008 after the government failed to prove its health risks. A number of studies have questioned the safety of the beverage. A study by the Cardiovascular Research Centre at Royal Adelaide Hospital in Denmark, found one can of Red Bull is enough to raise the risk of heart attack or stroke. The study carried out on university students found that drinking one 250 ml of the sugar-free version of the energy drink, increased stickiness of blood which can lead to clotting. Students are known to guzzle the drink to stay awake during examinations. A BSc final year student of Mumbai University admitted she takes six to seven cans of energy drink to keep awake. "I stock crates of Red Bull during exams," she said. Energy drinks are also called clubber's drink as they are often mixed with alcohol, usually vodka. The European Commission's scientific committee on food in 2003 said caffeine levels in energy drinks are safe but more studies are needed to assess the risks posed by other ingredients like taurine, an amino acid, and glucuronolactone. A 2006 study in the US on 10 energy drinks, however, found the caffeine content of these drinks too high. 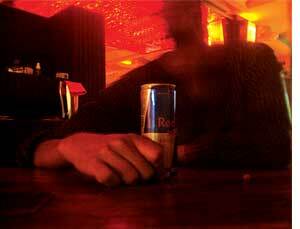 An early study in 2000 by the French Scientific Committee too found Red Bull contained excessive caffeine. "There is no concrete scientific evidence on health effects of energy drinks but it is known that high caffeine leads to health problems," said M S Kamath, a Mumbai-based physician. In spite of growing number of studies that question their safety, energy drinks are doing brisk business in all countries including India where its market is pegged at Rs 100 crore.